Two years after his fight against the Green Goblin, Peter Parker (Tobey Maguire) struggles to balance his part-time job and university studies with his secret life as Spider-Man. Things look up when he meets the scientific genius Otto Octavius (Alfred Molina) – but then a terrible accident transforms Octavius into the deranged super-villain Dr Octopus, and the whole of New York is threatened by his actions. Superhero movies have saturated American cinema in the past decade, driven by Marvel Studios’ ever-expanding film franchise. Sam Raimi’s 2004 sequel Spider-Man 2 is part of the lead-up to that. It’s the middle part of a franchise that resoundingly proved the box office potential of Marvel’s bank of characters. It is also easily the best of Raimi’s three Spider-Man adventures, with great action, a cleanly drawn and effective story, and tremendous character work. 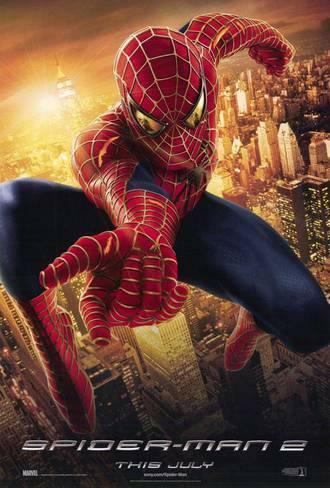 There have been dozens of superhero films produced since Spider-Man 2; it is still superior to most of them. Raimi is such a smart fit for Spider-Man. He has an exaggerated visual aesthetic that he employs in ways that enhance rather than distract from the story. The film boasts extreme close-ups on emotional beats, fast-moving long takes during the action sequences, and – my personal favourites – the heavy earth-shaking steps of Dr Octopus’ approach being reflected in sudden jump-cut zooms closer and closer to Peter and love interest Mary-Jane (Kirsten Dunst) looking on in horror. The film is also richly coloured and regularly brightly lit, which marks a nice contrast with a lot of its successors. If there is a direct ancestor to Raimi’s Spider-Man it is Richard Donner’s Superman: a simple story about a proper hero trying to do the right thing. There are two main aspects to the comic book Spider-Man. Firstly the witty quips: when fighting his enemies Parker simply cannot keep his mouth shot, and peppers the combat with jokes and insults. Secondly there’s the misfortune: despite all that he gives New York in his Spider-Man alter-ego, in everyday life Parker never gets a break. Here he loses his job, almost fails university, fails to get the girl, loses a best friend and upsets his aunt. There is a constant tension between doing what is right and quitting for a normal life. Raimi – along with writers Alfred Gough, Miles Millar, Michael Chabon, and Alvin Sargent – smartly drops the former for the latter. A Spider-Man who constantly launches snarky bon mots can quickly become tiring on screen. A Spider-Man whose life is a constant struggle is the perfect generator for character development and drama. It is what has made Tobey Maguire arguably the definitive on-screen Spider-Man. He is always struggling with his conscience and his wants. This second film is the most active and engaged in exploring this material, and it is part of what makes it such a richly rewarding film. The other is the film’s antagonist. The film introduces Octavius as a scientific genius preparing to give near-unlimited clean energy to the world, only for a catastrophic accident to kill his wife and leave him under the influence of four artificially intelligent robot arms grafted to his body. There is the issue of ‘women in refrigerators’ hanging over the character (essentially the death of female character included only to motivate a male one), but there’s also a very classic sense of tragedy. He is a villain that you feel sorry for. Alfred Molina gives a strong and memorable performance in the role, juggling moments of regret with those of humour, rage, and menace. It is one of the strongest performances of its kind, and testament to casting a talented actor in the role rather than a popular but limited star (check out Arnold Schwarzenegger in Batman & Robin for what I mean). There have been six Spider-Man features to date, not including TV spin-offs, and Spider-man 2 remains the best of the set. For the superhero movie genre, it remains one of the high points. Still love it all these years later. Nice review.